The Wisconsin Republican has sought to keep the GOP caucus on Capitol Hill focused on legislative priorities. His Twitter account is full of messages about the need to overhaul the U.S. tax code. But Trump has shifted the public’s attention away from the Republican agenda with his renewed declaration that “there is blame on both sides” for the violence last weekend in Charlottesville, Virginia. 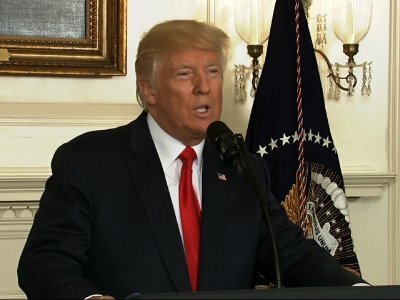 President Donald Trump is blasting the CEOs who resigned from his manufacturing jobs council in the wake of the violence stemming from a white supremacist rally this past weekend in Charlottesville, Virginia, that led to the death of one counter-protester. Scott Paul, president of the Alliance for American Manufacturing, announced his resignation Tuesday, a day after a raft of departures by CEOs heading large U.S. corporations. The heads of pharmaceutical giant Merck, the sports gear company Under Armour and the tech firm Intel decided to leave the advisory council. Trump initially criticized the violence on many sides, rather than singling out the white supremacists. The president on Monday later said condemned groups tied to racism. Trump has not said if who will join his council as replacements. The leaders of four minority House caucus groups have written a letter to President Donald Trump calling for the removal of White House staff aides Steve Bannon, Stephen Miller and Sebastian Gorka. President Donald Trump is back in the New York skyscraper that bears his name as the furor over his reaction to race-fueled clashes in Charlottesville, Virginia, over the weekend shows few signs of dying down.